Launceston’s Natural Heart walking tour showcases the essence of the Launceston Cataract Gorge. Launceston’s Natural Heart showcases the essence of the Cataract Gorge. This 45 minute loop walk provides the ideal essentials for your visit to the Cataract Gorge. Taking you around the picturesque First Basin and connecting you to the natural wonder of this city wilderness. Hear about this unique natural environment, and experience the picturesque First Basin, the earthy heart of Launceston and its people. Not only will you see and hear the Cataract Gorge, but you’ll also taste, smell and touch it! We’ll start on the lawns adjacent to the Basin Café and loop around the Basin, crossing the swinging bridge, take a look into the lovely Cliff Grounds gardens, and then back across the Basin causeway. With four stops along the way, before finishing on the lawns near the pool. Leave with a true understanding of why this really is the natural heart of Launceston! An average level of fitness is required. This walk crosses a suspension bridge. There are no steps along the entire walk, making it suitable for people with limited mobility. Starts: at First Basin just inside the entry from the carpark, on the lawn adjacent to the Basin Café and close to the Scenic Chairlift ticketbooth (both are easy to find). Ends: nearby at First Basin, on the lawns in front of the swimming pool. From here you can explore further and take in other activities in Cataract Gorge. 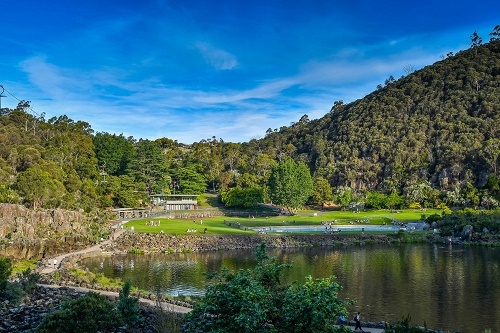 How to get there: First Basin is the most popular access point to the Cataract Gorge Reserve for visitors to Launceston. You can walk into the First Basin from the Launceston CBD via the (flat and easy) Cataract Walk, or (the more strenuous) Zig Zag Track. The street address for the First Basin car park is 72 Basin Rd Parking, metered charges apply ($3.00 for four hours). The driving time from the CBD is approximately 10 minutes. Visitors will most definitely want your camera handy to capture the breathtaking scenery! And perhaps THE selfie of your entire Tasmanian holiday. Although a 45 minute walk isn’t a long time, you may want to bring some water with you. Please protect yourself from the weather, especially the sun. Cover up with clothing and a hat, and sunscreen. The tour will operate in all weather (as long as it’s safe to do so), so please dress accordingly. Come along in any comfortable clothing. This is not a hike into the remote wilderness, any flat comfortable footwear is ideal. You may want to have your credit card or a little cash on hand, as there are other activities to enjoy – including the Gorge Scenic Chairlift, the Basin Café, and the Gorge Restaurant.